Location, location, location. Hyde Park offers all the benefits of big-city living without any of the noise and traffic. We are located in peaceful Winter Garden near the southern shore of Lake Apopka and just minutes away from downtown Orlando (and the theme parks) by car. Hyde Park is a resort-style community with lots of amenities onsite, including a spacious modern clubhouse that features a banquet hall, fitness center, full kitchen, library, shuffleboard courts, large outdoor swimming pool, and more. Seven days a week, there is always something to do at Hyde Park. Our residents regularly meet up to play cards, play Bingo, attend onsite seminars, enjoy potluck dinners, and engage in similar structured activities. Hyde Park is rare among Orlando area mobile home communities in that we have a full-time onsite professional management staff who all help make sure that the community runs smoothly. Our 55+ community near Orlando is pet friendly. The streets of our community are lined with affordably priced manufactured homes featuring modern interior and low-maintenance exteriors. 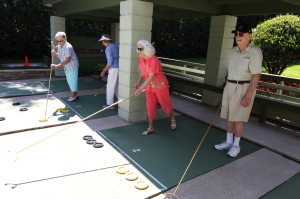 Hyde Park is specifically designed to cater to the lifestyle goals of adults 55 and over. In fact, it’s more than just a place to live … it’s a lifestyle. We offer you the opportunity to buy a mobile home inside of a welcoming community that makes it easy to stay active, have fun, and enjoy retirement! For more information about Hyde Park and why it’s rightly called one of the premier mobile home communities in the Orlando area – if not all of Florida – please contact us today.